Today we didn't have to set the alarm, but I did wake up on my own at 7 AM. (It will have to be earlier Thursday-Sunday.) I caught up on some things on the computer including some Day Jobbe and let Lisa sleep. When she woke up, we went to the hotel restaurant for breakfast. After that, we confirmed that we had the tow hitch for the minivan (I booked the U-Haul trailer later) and Lisa found that while we didn't have the exact connectors for the trailer lights, we had the parts from which she could make the connector, which she did later. We went to the Volunteer desk and completed our volunteer waiver forms and picked up our "Move-In" stickers that gave us access to the exhibit halls during set-up. The hall areas were indeed taking shape. This area will be much busier starting tomorrow. We checked with the convention office, and some, but not all, of the signage ordered for the Business Meeting and for Match Game SF had arrived. The rest should arrive tomorrow. I signed for the signage that was ready and stored it in our hotel room. 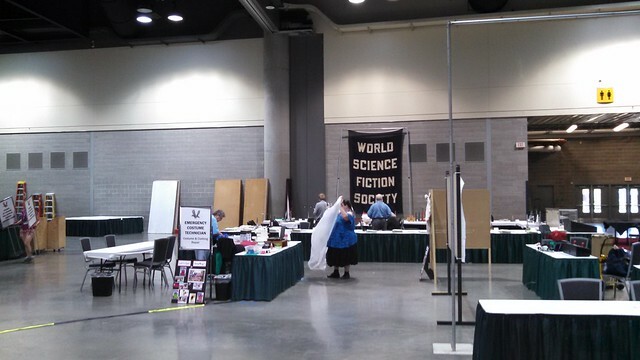 We have a nice WORLD SCIENCE FICTION SOCIETY banner that we can hang from the head table of the meeting, and two new vinyl banners for MGSF, courtesy of Sasquan. While unpacking my bags last night, I announced, "I sure hope there is a bag of my socks sitting on the bed back home, and not left behind in one of the hotels in which we've stayed these past few days." I had no socks save those on my feet. That at least is something we can fix, and just before Noon, after storing Chris' bags with us, Lisa and I and Chris walked to the mall a few blocks down the street from the hotel. On our previous visit back in June, the cable-car ride across the Spokane Falls had been closed, but it was open today, and our walking route to the mall took us past the entrance. On impulse, I suggested we take the ride. 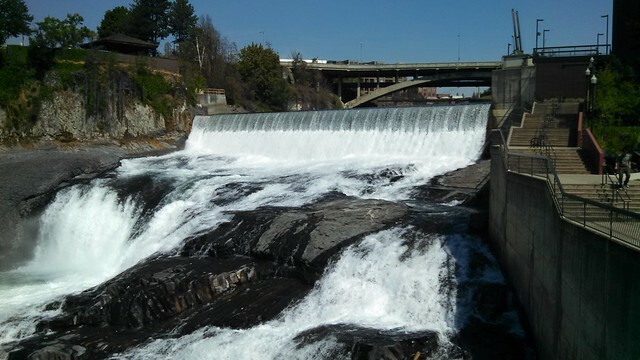 This is an aerial tram that takes you back and forth across the fact of the Spokane Falls, including scenes like these. (Click through to see more in the surrounding photos.) I'm glad we finally got to take this ride. As we exited the ride, the attendant, noting our Sasquan shirts, said, "Enjoy the convention!" I said, "Thank you! Are you going?" She said, "I've had my ticket for two years!" Lisa gently explained that they were "memberships," not "tickets," since we're all members and everyone is volunteering. She said that was awesome, and we told her that we hoped she had a good time. Having played our bit of hooky from convention set-up, I got may socks settled and we returned to the convention center. 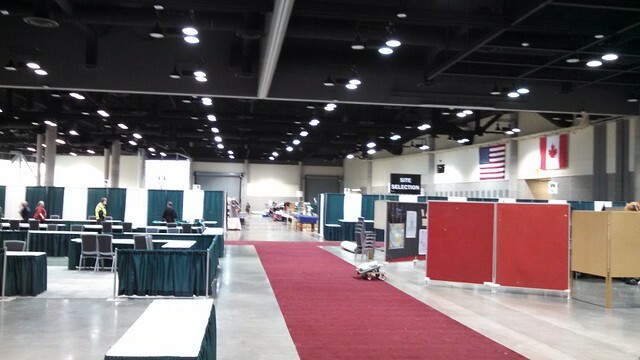 Spokane may be the smallest city to ever host a Worldcon. Consequently, we are a really big deal here. Members of the convention committee went to a city council meeting yesterday where the council presented them with a framed official resolution welcoming the convention to the city. 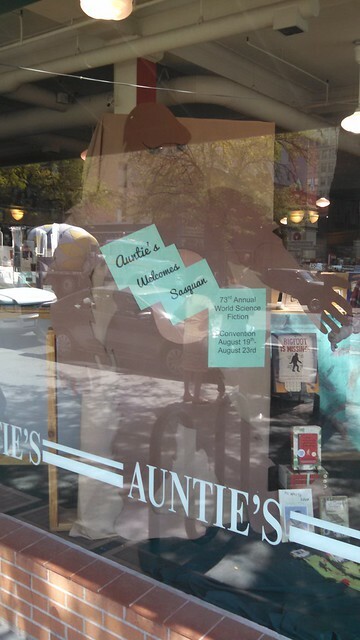 Auntie's Bookstore, a few blocks from the convention center and on one of the likely walking routes between the convention center and the Historic Davenport (party) Hotel, had this display welcoming Sasquan to town. Back at the convention center, things were getting warmed up, even though there's no programming today. We checked out Rooms 300AB (where the Business Meeting and Match Game SF will be. Most things are okay, but the lecterns we requested haven't shown up, and we're not sure about electrical power for the camera platform. I checked with the head of Facilities and he'll look into it. We should manage. The first Business Meeting is Thursday, not tomorrow. 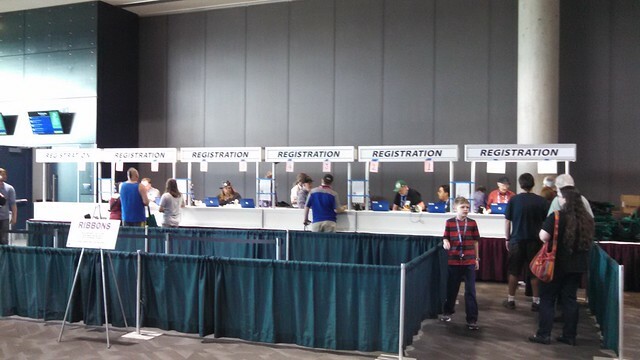 Registration was scheduled to open at 3 PM, but they were ready to go at 2:40 and so started registering people. I got my and Lisa's badges (my thanks to Elayne Pelz for letting me collect Lisa's badge for her) because Lisa and Chris had gone up to the hotel room to try and sort out a technical issue with Chris' computer reading the P2 cards out of the video camera. (They never did get it sorted, but they've got a workaround, and fortunately we have alternative systems set up.) Registration was going smoothly, and thanks to a large number of registration stations and a system that worked from the get-go, there was no repeat of the absurd log-jam on registration we had at the same point last year. 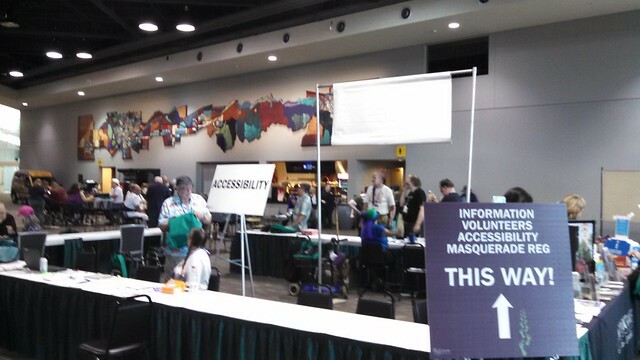 Although there have been what I might consider the usual number of minor incidents of convention move-in confusion, it's nothing out of the ordinary, and in fact things in which I was involved seemed to go pretty smoothly. It's off to a good start. Let's see how tomorrow's actual start of the convention goes. I'm one of the opening panelist in a Noon panel about the WSFS Business Meeting. Opening Ceremonies are at 3 PM, and I have the WSFS Mark Protection Committee meeting at 7 PM. Fingers crossed for more smooth running.